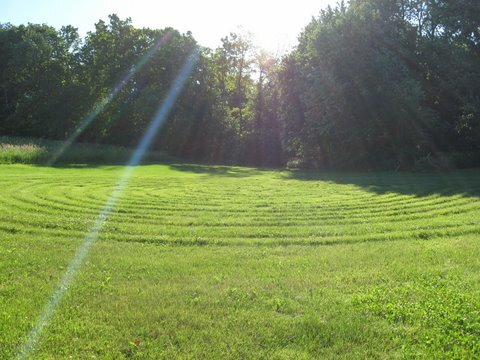 During the Summer of 2007, we created a Labyrinth in the grass at Still Point Zen Center. The design is an ancient one, consisting of 11 concentric circuits, and 28 complete turns. This design is found at many Medieval Cathedrals including the most famous remaining one at Chartres Catherdral in France. Forty people came to Still Point on a warm October day to participate in a series of events including the dedication of the Labyrinth, Dances of Universal Peace, a Drumming Circle, and a bonfire.